JT IRREGULARS: "Florida's 2016 'Officer of the Year' arrested after feces, guns, drugs allegedly found in his 'disgusting' home"
"Florida's 2016 'Officer of the Year' arrested after feces, guns, drugs allegedly found in his 'disgusting' home"
A former U.S. Army Ranger who won the Florida Sheriffs Association’s 2016 “Law Enforcement Officer of the Year” award has been fired from his job as a deputy after authorities found feces, guns, drugs and assorted garbage strewn about his “absolutely disgusting” home. Bevard County Deputy Nicholas Worthy and his live-in girlfriend, Rachel Trexler, were arrested Thursday after police searched the Rockledge property where they lived with their 2-year-old child and three dogs. "The house was in complete disarray. There was dog feces all over the house, there were firearms, ammunition, other types of trash and food," said Brevard County Sheriff Wayne Ivey. "Also found was a small amount of drugs that was inside the home and inside a vehicle." Worthy – who has since been fired -- and Trexler are both facing charges of child neglect and possession of cocaine, marijuana and drug paraphernalia, the Orlando Sentinel reported. Worthy left Brevard County Jail after posting a $5,000 bond on Thursday, according to FOX35. The status of Trexler, who was also taken to Brevard County Jail, wasn't immediately clear Friday. The child was taken by the Florida Department of Children and Families and the trio of dogs are now being looked after by Brevard County Animal Services. Ivey said officials were called to the home Wednesday night after a neighbor reported hearing gunshots. Police failed to make contact with the officer and returned the next morning with a search warrant. After they forcibly entered the home, police found the conditions inside “absolutely disgusting” and “deplorable,” Ivey said, according to FOX35. He added evidence was found consistent with the gunshots that were reported. 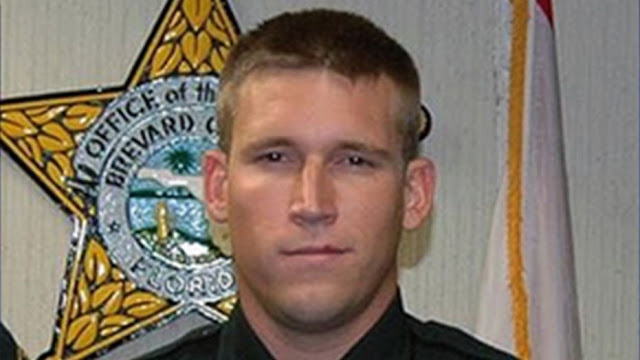 The arrest and charges are a stunning fall from grace for Worthy, a native of the area who joined the Brevard County Sheriff’s Office in 2012 following a tour in Afghanistan two years earlier. He was awarded the Bronze Star Medal of Valor for his actions overseas, the Florida Sheriffs Association said. The organization gave him their “Law Enforcement Officer of the Year” award in 2016 for his response to two incidents the year before. In February 2015, they said he and two other deputies broke a bedroom window at a burning home in Cocoa and carried a resident to safety. A month later, Worthy responded to the same area and took out an “individual who was shooting into houses, randomly going through a neighborhood and shooting into houses,” Ivey said. “It is clear to tell that whether serving Brevard County or our Nation at large, Nicholas Worthy is one of the few who are willing to run toward danger instead of away,” the Florida Sheriffs Association said when Worthy was given the honor. Black as Coal Soul Inside.